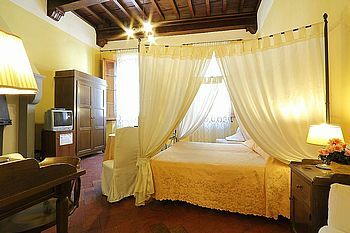 When some years ago, we decided to create our B & B, the intention was just to create a romantic environment. There was certainly a great help to the happy position that the B & B occupies the heart of the city. But most of all we tried to characterize the environment by putting extreme care in selecting the items that our customers would have used one day during their stay in Florence. Everything in our B & B is romantic. This is the atmosphere that we tried to create in our little abode. The few rooms contained within this struggente bed and breakfast, very humbly attempt to offer a unique and unforgettable charming atmosphere.